Image Size: 15 X 10 in. "While vacationing on Cape Cod each year, we made it a point to stop off and spend some time with our friend who was a bird carver. 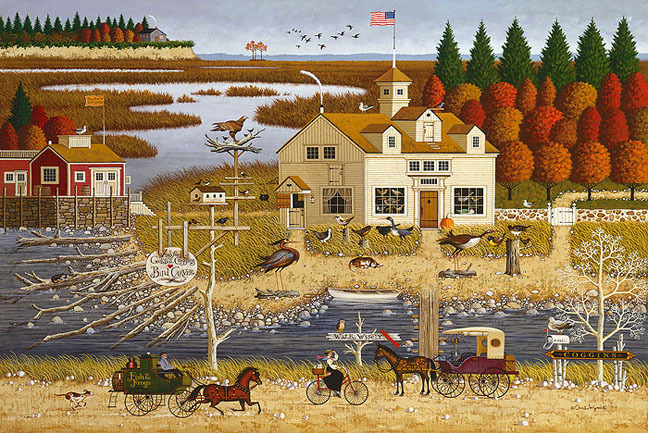 His shop was perched on the edge of a marsh meadow and bird preserve, just outside Sandwich, Massachusetts. After many years of visiting, this painting came to fruition. “Carver Coggins was a joy to paint and supplied me, as I was painting, with many happy memories of conversations with a fond acquaintance."